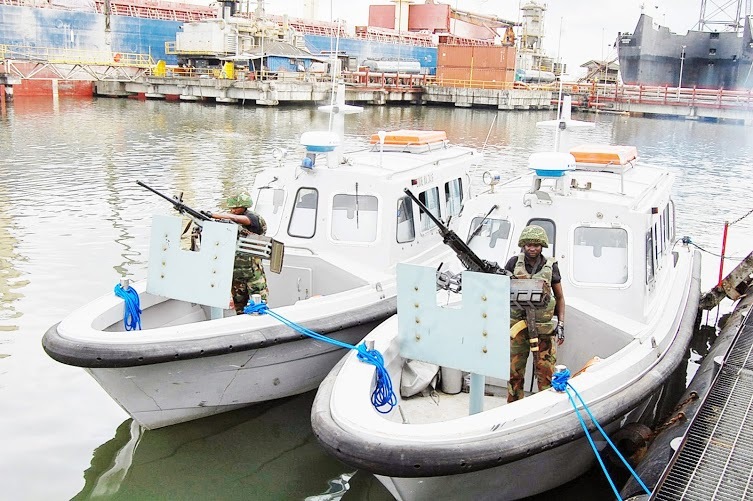 Made-in-Nigeria Modant Marine MM90E river gunboats of the Joint Task Force Army Component. These units are armed with the Singapore Technologies Kinetics 12.7mm heavy machine guns. This entry was posted in Uncategorized and tagged DEFENCE AND SECURITY NEWS, GEOPOLITICS AND STRATEGIC STUDIES, GUERRILLA WARFARE, MODANT MARINE GUNBOATS, NIGERIAN AIR FORCE, NIGERIAN ARMED FORCES, NIGERIAN ARMY, NIGERIAN MILITARY HISTORY, NIGERIAN NAVY, TERRORISM. Bookmark the permalink. If the United States starts shutting down her Military bases, then we should start arming up.They (U.S.) may actually sell up some of their ships as EDA. Lets snap them up. how about we patronise our own industries and become a major weapons manufacturer? We should be happy we have a made-in-Nigerian boat at all. If the US is de-militarizing then we should struggle to acquire some hardwares, with the state of our Forces any equipment will do any one at all. The modant boats are for light patrol duties Plus harbor police patrol it will only engage lightly armed thieves not french frigates. The US may actually be putting up for sale large numbers of the highly successful A10 Warthog Tank busters. This aircraft beats the SU25/27 in performance in the heavy ground attack role. If we can make a good case using the Boko Haram problem, we might permitted to buy 24 of these birds. Different platforms for different missions and different enviroment. I am sure this is for ‘soft littoral missions’. The Beeg one, please start a thread on the latest BH killing of 49 students in Yobe. The US usually do not give African countries their airplanes even if its mothballed or decomissioned. Besides I prefer the SU 25SM (latest variant) even the russkies are still fielding it for decades more. US planes and their maintenance and spare part issue.